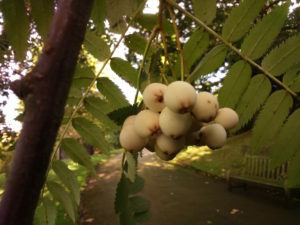 This beautiful, small Kashmir Mountain Ash tree which has highly serrated leaves and is reminiscent of Sorbus aucuparia having leaves composed of 17 to 19 highly serrated leaflets and can be found on the American Bank. In spring it has rose like flowers in soft pink, which in time turn to loose, drooping clusters of white fruits, which are shiny and bright in the sun. The fruit stays on the tree long after the leaves have fallen, either because they are too large for birds to eat or they don’t like the colour. Many of these Sorbus have highly coloured leaves in autumn and Sorbus cashmiriana is no exception its leaves turning orange red and gold. The tree comes from the Western Himalayas and grows to 8m tall and grows best in moist but well drained soil that needs to be acid to neutral. Unfortunately the tree is fairly short lived.